My senior year in high school, I had to take a Speech class. I dreaded most of the assignments because I didn’t enjoy speaking in front of people. However, I got excited when we were asked to select a children’s book to read aloud to the class. I had been reading books aloud to children in our church nursery and day care center for years, so I knew I would finally feel comfortable with this public speaking assignment – although my classmates were a bit of a tougher crowd than the three-year-olds I normally addressed! I chose Dr. Seuss’ And to Think That I Saw It on Mulberry Street and I think I got my best grade of the school year that day! I have been reading aloud to our daughters since before they were born. Not only have I shared with them favorite books from my childhood, but we have also discovered many new stories that all of us treasure. 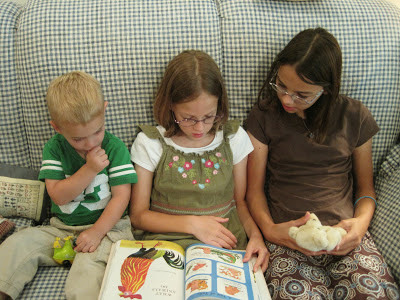 Here are some of my favorite tips for reading aloud to children. Schedule read-aloud times. Those that have worked best for us (depending on the age level) are just before bedtime, before nap, and right after lunch. While we also did plenty of spontaneous reading when our girls were younger, I could count on having those planned reading times if our day got absorbed with other activities. Tailor your reading to their interests. Whether they like trucks, princesses, or dragons, find age-appropriate books about their latest fascination. Read books that are on their level. When reading aloud, you can typically read books that are above what they can read on their own, but it’s best to make sure the vocabulary and concepts used in the story fit their current understanding. Branch out into different genres. It’s easy to get stuck just reading fiction, but attempt to find non-fiction books, autobiographies and biographies, and perhaps even some poetry. Be expressive. Use different voices for various characters or add expression by making your voice louder and softer. It may feel silly at first, but your kids will enjoy the story even more. What other tips make read-aloud time special at your house? Can you suggest any good read aloud chapter books or longer books for 4 to 5 year olds? I have been trying to find books my daughter will listen to besides picture books. If you'd like to start with really short chapter books, we enjoyed Easy Reader series like Amanda Pig by Jean Van Leeuwen, Amelia Bedelia by Peggy Parish, and Frog and Toad by Arnold Lobel. If you want stand-alone books, Charlotte's Web by E.B. White and A Little Princess by Frances Hodgson Burnett were two of our favorites. Hope that gives you a good start!